Today we followed in the footsteps of Roman Emperor Augustus! The road we followed is the most perfect stretch of Roman road left in Spain. While Augustus would have travelled with a retinue of servants that aren’t available to us, we had to look after ourselves by making sure our water bottles were full and that we had some food with us before leaving Calzadilla de los Hermanillos. 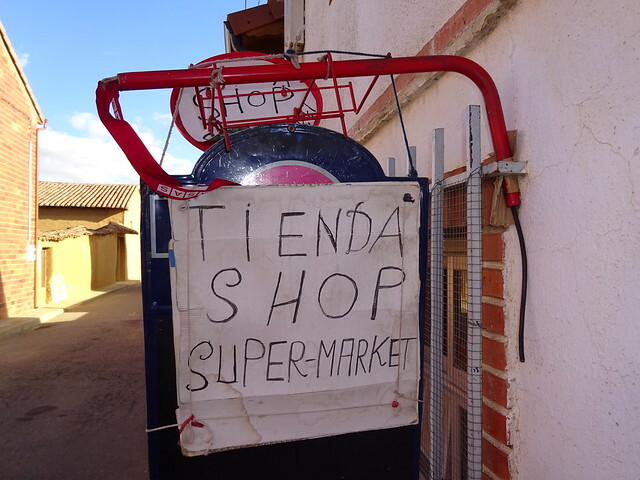 It was hard to find, but yesterday evening we eventually found the one and only tienda (grocery store) in Calzadilla and picked up a couple packages of nuts and a package of chocolate chip cookies. We ate the whole package of cookies before noon – shame on us! We left the albergue in Calzadilla at 7:45 a.m., just as it was beginning to get light. The walk started out much like yesterday, so cold that I pulled out a pair of wool socks from my backpack and wore them on my hands. 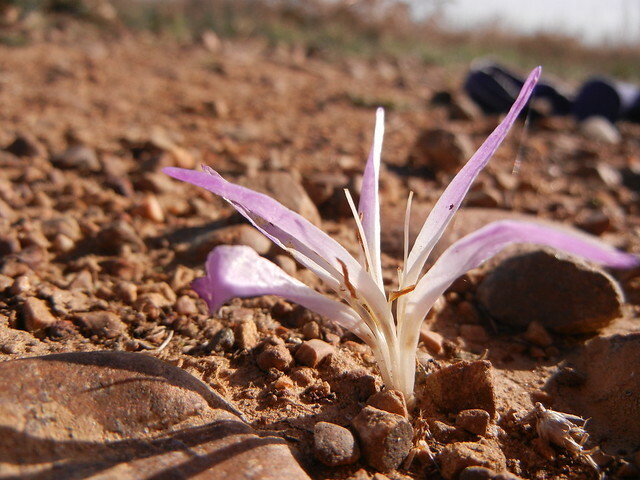 The sky was blue, the terrain was mostly flat with few asphalt roads, no towns, houses, or water. 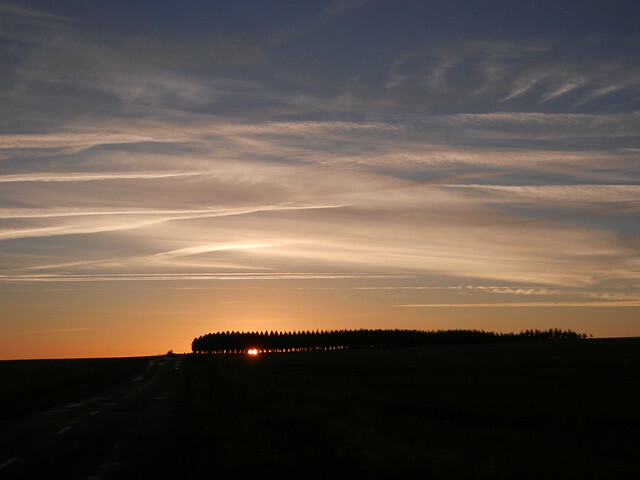 It went on like that for almost twenty kilometers. “Are we there yet?” In the early afternoon we were both whining about how long, straight, and boring the final 6.2 km home stretch was alongside the highway heading into Mansilla de las Mulas. My legs didn’t want to move and, if it wasn’t for my poles propelling me forward, I’d still be out there. We both have sore feet and I was a little wobbly after walking 24.5 km, but otherwise we’re okay. 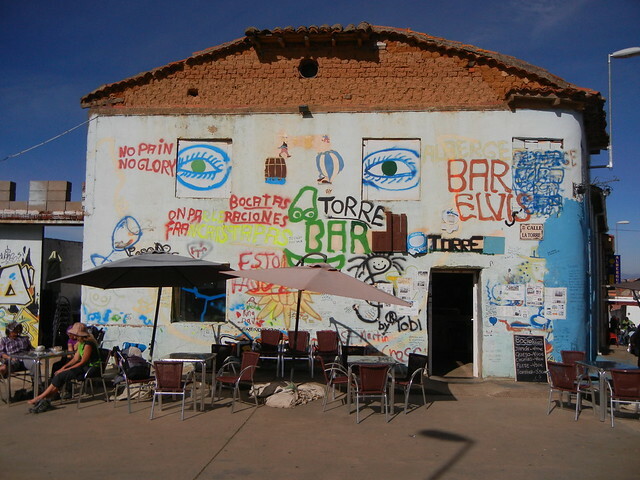 The name of the town, Mansilla de las Mulas, means “hand on the saddle of the mules,” most likely because of the town’s earlier prominence as a livestock market. It was such a relief to finally arrive and check in at the Albergue El Jardin del Camino where we have a private room with bath. We didn’t waste any time dropping off our backpacks and going straight to the bar and ordering two huge bocadillas and cervezas. 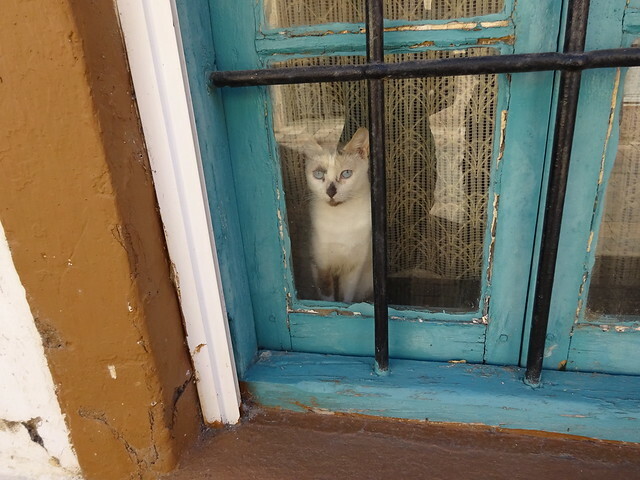 It felt marvelous to relax and chow down at an outdoor table in the garden, but we had to feel compassion for newcomers obviously at the end of their rope, arriving and leaving soon after because there was no vacancy. We were glad that the host where we stayed last night in Calzadilla de los Hermanillos phoned to make the reservation for us. Our minds now are on weighing our options about how to see Leon, only 18.6 km away. There is a lot to see, and you could spend days and only see half of it. Something big is happening there from October 5-12 so there are no vacancies except for one hotel that costs 350 Euros! We plan to leave here early tomorrow so that we can get a bed in an albergue at noon or shortly after. We have been on remote paths over the past few days, so have to prepare for a long and wearisome slog into and out of the city centre along a busy and dangerous highway. There is an option to take the bus but the idea of taking public transport might seem like breaking a commitment. We don’t mind the idea of taking a bus from Santiago to Finisterre (the end of the earth), but we will get off the bus at least 10 km. before reaching Finisterre so that we are on foot when we go over the last hill and see the Atlantic Ocean for the first time. 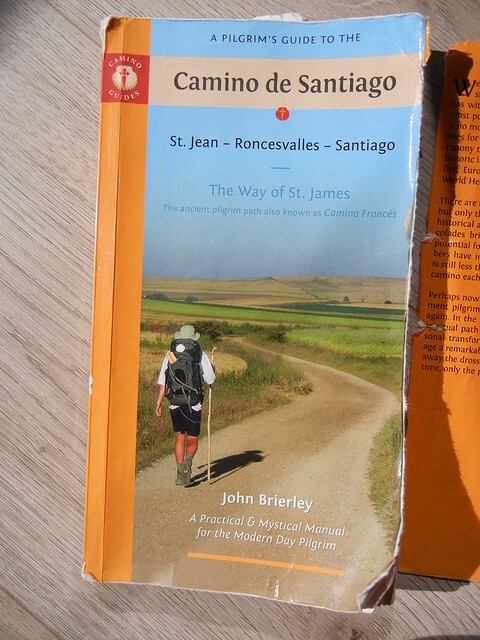 The John Brierley book is looking dog-eared now and we hope it holds together until we reach Santiago. 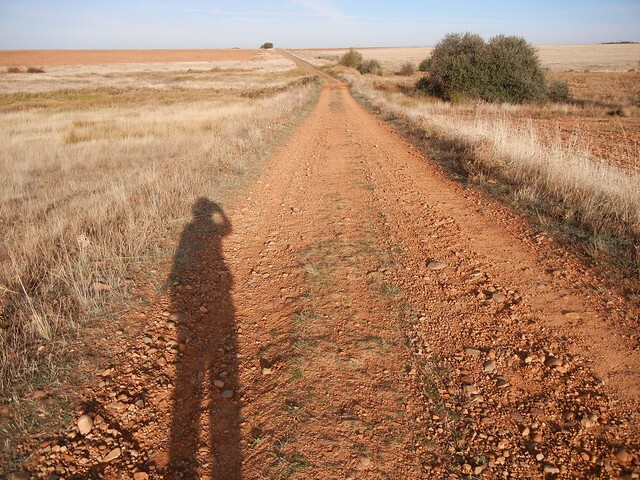 In the meantime, we were looking at some of our photos and wondering if the location of our photo and the one on the book cover are taken in the same place – approaching Sahagun. Wow! Beautiful images! I think the picture you took could be the same place as on the book cover and it could also be the same as the photo I uploaded to your blog header too. Yes, we thought so. 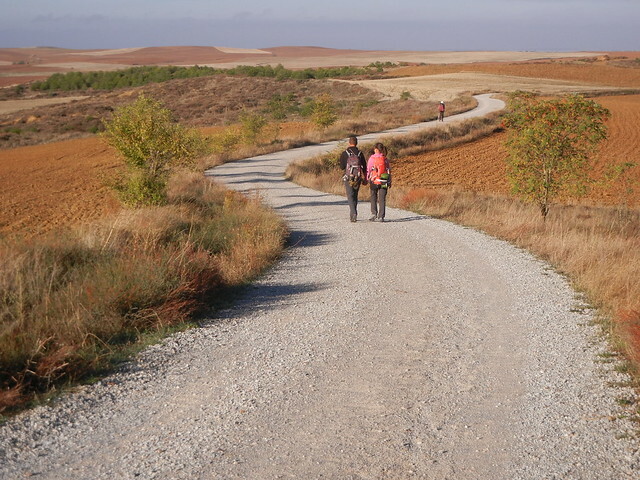 It might have been between San Nicholas del Camino and Sahagun (Stage 18 in the book). We’re glad you are enjoying the blog, Françoise, just as we are having fun deciding what parts of our day are most important to tell about. We’re loving this experience! Jane and I have so enjoyed reading the words you have written, and poring over pictures you have taken. It has brought back our own wonderful memories of our own walk. I thought it would be fitting to reconnect with you on the same day’s journey that connected you to us. May your journey continue to be a precious time spent together! Buen Camino! We continue with you in spirit. Good to hear from you, David and Jane. That’s right! It was this section with no facilities that I was worried about, but there was no concern in the end. The new edition of the John Brierley guide has the main Camino route going along the highway and the remote, scenic one being the alternate. Very few people went this way.